Made at the Nagoya Music Factory in Japan. The instrument on the left is the Kingston EM1, produced between 1964 and 1967. The scale is 15.75 inches—more mandola than mandolin, but most players tune them GDAE. The long scale reportedly gives the EM1 a lot of sustain. The Nagoya Music Factory also produced the Bruno and the Conqueror; however, the Conqueror trade name did not exist until late 1966. Both instruments share the same neck style; the Kingston has symmetrical body horns whereas the Conqueror has a larger horn on the bass bout. The crucial difference, however, is in the pickup. The early Kingston has a chrome pickup with a piece of gold foil on the face with four screws. The magnets actually have a wire bobbin wound around them. The pickup on the Conqueror had a bobbin that was first wrapped around a plastic sleeve before being slipped over the magnetic pole pieces. Japanese instruments made at other factories include the Kent and San Remo electrics. The Kingston in the center was clearly inspired by the similarly shaped "mandoguitars" built by Vox. It reportedly never caught on because the neck was too narrow to play comfortably. 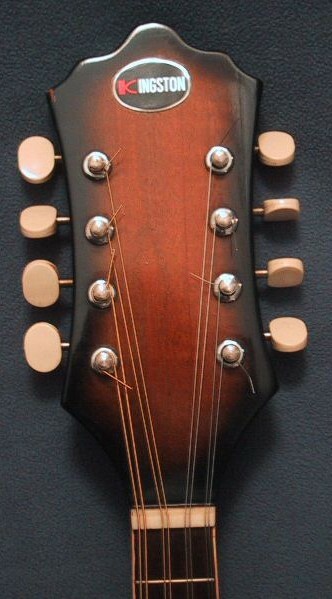 Michael Spicer of Canada has built some mandolins similar to this one.